When it came out last year, the first Human Centipede film generated a huge amount of publicity due to its original, if disgusting, central idea. Within weeks of its release there were countless articles, analyses and jokes about the film – there was even a South Park episode parodying it. In spite of its place in the public consciousness however, relatively few people actually watched the film. Consequently, when the inevitable sequel, Human Centipede 2 was announced, it initially didn’t make much of a splash outside of our film fanatic community. Even in the run up to the film’s planned straight-to-DVD release this summer, it wasn’t getting more coverage than any similar cult horror film. And then, in June, the British Board of Film Classification ‘banned’* it, causing every news outlet in the country, and many more around the world to suddenly take an interest in the movie. We were no exception, reporting “The BBFC have denied The Human Centipede sequel a certificate on the outrageous grounds that it’s too “sexually violent and potentially obscene””. With the film finally out in the UK, we decided that it was the perfect time for us to do some digging, and try to understand what it was that so offended the BBFC initially, and what persuaded them to finally change their minds. In the interest of balance, we also spoke to Tom Six and Laurence R. Harvey, respectively the director and star of Human Centipede 2. ‘It seemed to us that the film could be read in a variety of ways, as many films can be. However, we also felt the film went to such extremes that it breached the Classification Guidelines and posed a real, as opposed to a fanciful, risk of harm to potential viewers within the terms of the Video Recordings Act 1984 and may have been in breach of the Obscene Publications Acts 1959 and 1964’. 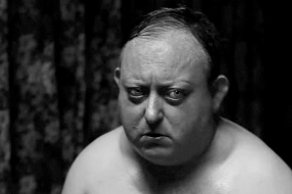 The Human Centipede 2: Full Sequence is available on DVD and Blu-Ray from Monday. Further information about the BBFC can be found on their website. You can also read our earlier interview with Craig Lapper of the BBFC. *Or rather, they refused to give the film a classification, which barred any UK-based DVD supplier from selling it. Contrary to the hundreds of alarmist headlines from the now-interested news media, the BBFC don’t ban films. The HeyUGuys Reaction Shot: Do we need Film Censorship?